First off, welcome to the neighborhood! I hope you enjoy living in the area. I live in the center square area, on State st. off of Lark St. 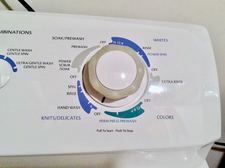 I have my own washer and dryer in the building, however, they are old and the dryer does not dry clothes without having to complete two cycles (which ends up being 2 hours). I decided to stop using them and just recently used Rocco's Laundromat, mainly because it is right up the street on Lark. Dirty Harry's is nearby as well, but is not as cheap. I would recommend using Rocco's, if you are close by. The dryers are nice commercial ones and my load was dry in less than an hour. Check out Lucky Cat Laundromat. Brand new place downtown with high-tech machines and I think they do pickup/delivery as well. I live in center square and use a wash & fold laundromat right next to Grappa '72 and Plato's Closet (near Hannaford on Central Ave). It's $1 per pound with a ten pound minimum. They seem to specialize in wash and fold. You can drop off in the morning and pick up in the afternoon. My co-worker recommended them and I've been very happy. I tried finding something closer, but I didn't have any luck.